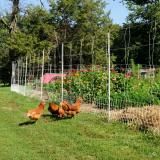 A net that stops most livestock and wildlife pests. 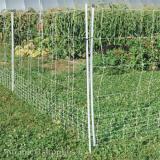 It's a combination of Deer QuikFence and VersaNet 20". VersaNet Plus is 60" (5 ft) tall to discourage and deter large or athletic species of livestock, deer, bears, dogs, wild pigs and coyotes. 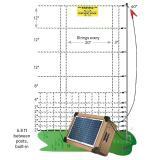 Has verticals every 3" near the bottom to stop small animals (rabbits, woodchucks, raccoons, skunks, dogs) and large ground birds (geese, ducks). Near the top, verticals are every 20". This unique spacing reduces both initial cost and sagging between line posts. 12 horizontal strands that are spaced close together near the ground. Why use VersaNet Plus 60 instead of PermaNet, VersaNet Plus 20 or Deer QuikFence? Taller than 48" PermaNet and 20" VersaNet Plus. Fewer overall strands than PermaNet 19/68/3—so less weight. Therefore easier to install/remove. Small spacings close to the soil will stop small critters. Deer QuikFence can’t do this. 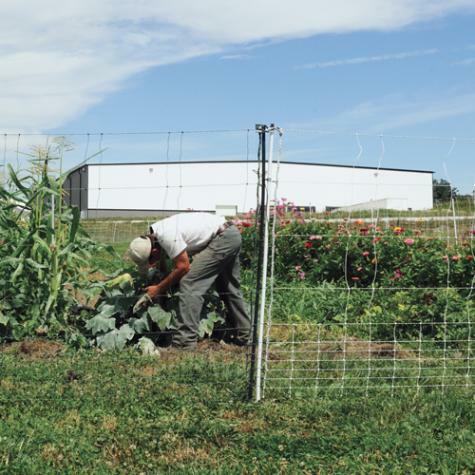 Tall netting will stop deer, elk, cattle, horses. VersaNet Plus 20 will not. The same “unroll and then unfold” process applies to all electrified nets. However, this net is heavier and post spikes are larger than our other nets (therefore more difficult to push into the soil). Because the rolls are long and heavy, installation requires 2 people. Extra line posts are usually not necessary but, due to the extra height and weight of this net, extra supports such as 11/16" FiberRods are useful at corners, curves and ends. You will need a fence energizer to electrify the net. We suggest installing with two people. Why? Because of its extra weight and longer posts. It can be handled, installed and removed by one person, but having another person on each end of the posts doubles the productivity and makes it easier for both. Pushing or stepping posts into the soil is still a one-person task. And so is pulling the posts out of the soil. But these tasks take more effort because the spikes are both larger and longer. (After all, it doesn’t work to have a strong, well-supported post without large and long spikes. Choose the length and the amount of netting needed. 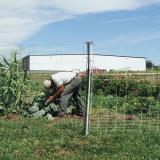 Example: A 150 ft fence requires one 100 ft net and one 50 ft net. Choose support posts—As needed for ends, curves and corners. Premier’s 11/16" FiberRods posts are advised. Select an energizer, ground rod and a fence tester. Use your 0.5 joule energizer as a plug-in system for electrifying an electric fence. 0.5 joule electric fence energizer with accessories for energizing a fence. Battery will need to be sourced elsewhere. Electric fence energizer kit for keeping your livestock in and their predators out. Battery powered electric fence energizer kit for keeping livestock in and their predators out. This 7 strand cable is covered with pliable plastic insulation. Unlike Double Insulated Wire, MaxiShock insulated cable does not require special connectors.